This season’s Sunday Afternoon concert series at the California Jazz Conservatory continues on February 17 with Ensemble Bizarria (Lindsey Strand-Polyak, violin; and Alexa Haynes-Pilon, cello) performing music from the Court of Modena. While most tourists and foodies today think of Modena in Northern Italy as the home of balsamic vinegar and Lamborghinis, 17th-century Italians knew Modena not only as the court of the once-legendary Este family, but also as a hotbed of instrumental virtuosity. Dukes Alfonso IV and Francesco II kept in their royal employ some of Italy’s finest string players. Yet rather than publish the music of these spectacular musicians, the Este nobles preferred to keep their court composers’ talents to themselves. Many of the fantastical works written by these composers lay buried in the archives for years. With “I virtuosi di Modena,” Ensemble Bizarria brings the music of the Este court to life, featuring rare gems for violin and cello by 17th-century composers Cima, Colombi, Uccellini. 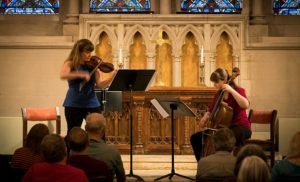 Ensemble Bizarria was founded by Lindsey Strand-Polyak (violin), Alexa Haynes-Pilon (cello), and Eric J. Wang (harpsichord) in 2016 and does baroque just a bit differently. They aim to shake off the powdered wigs of the seventeenth and eighteenth centuries, reclaim some of music’s wild past, and connect it to our equally wild present. Recent appearances include the Twin Cities Early Music Festival, the Fringe Series of both Boston and Berkeley Early Music Festivals, and the San Francisco Early Music Society’s Early Music Sundays Series. Ensemble Bizarria is the only early music group to have been selected as a recommended artist in the 2017 Beverley Hills National Auditions.